.. tools and data to examine how the U.S. by metro population is changing. Is the population moving away or into metros of interest? What are the trends; what is causing the change? What are the characteristics of the population moving in and out? How might this impact your living environment and business? This section provides information on how and why the population is changing by metro from 2010 to 2016 in terms of components of change: births, deaths and migration. It provides a summary of tools, interactive table and GIS project, to analyze population change by metro using latest Census Bureau estimates through 2016. These data are used by ProximityOne to develop/update annual demographic-economic projections. See related Web page to access full interactive table and more detail. The following graphic shows how metros (MSAs – Metropolitan Statisticsl Areas) changed from 2010 to 2016 based on percent population change. Click graphic for larger view; expand browser window for best quality view. A narrative summary and analysis of metro demographic characteristics and change, contextually with other data and geography, is provided for each metro in the Situation & Outlook Reports. See more about the wide-ranging subject matter that are knitted together in the schedule of updates. Examine metro dynamics in context of the U.S. overall and related states and counties. MSAs and MISAs together, or metro areas, comprised the set of Core-Based Statistical Areas (CBSAs). Each metro/CBSA is defined as a set of one or more contiguous counties. Use the full interactive table to examine U.S. national scope metros by population and components of change. Consider an application where you want to study metros having a 2016 population between 250,000 and 300,000. Use the tools below the interactive table to select these metros as illustrated in the graphic shown below. The graphic shows these metros ranked on the overall U.S. metro rank (percent population change 2010-2016). As shown in the graphic, the Greeley, CO metro was ranked 11th among all metros and the fastest growing metro in this group. Use the tools/buttons below the table to create custom views. .. new metropolitan statistical area designations are important; they identify transitioning and growing counties reaching a certain plateau of demographic-economic well-being. In July 2015, sixteen new Micropolitan Statistical Areas (MISAs) were designated, reflecting population growth through 2014. At the same time one MISA changed status to a Metropolitan Statistical Area (MSA) — Enid, OK. The five new Combined Statistical Areas (CSAs) reflect continuing urban agglomeration evolvement as contiguous metros grow and join adjacent metros. How will these new metros change by 2020? 2060? relate to others? See more detail in this related Web pages. Core-Based Statistical Areas (CBSAs — the collective set of MSAs and MISAs) designations are updated from periodically based on changing demographic-economic conditions. The July 2015 CBSA designations, summarized here, update the previous February 2013 CBSA designations. CBSAs are comprised of one or more contiguous counties. CBSA designations are made by OMB based primarily on Census Bureau data. There are now 945 CBSAs (MSAs and MISAs) in the U.S. and Puerto Rico. • 389 MSAs (382 in the United States and 7 in Puerto Rico). .. 11 MSAs contain a total of 31 Metropolitan Divisions (MDs). • 556 MISAs (551 in the U.S. and 5 in Puerto Rico). 174 Combined Statistical Areas (CSAs) now exist with a total of 537 component MSAs and MISAs. Updates provided here are based on 2010 standards for delineating MSAs and MISAs. The updates reflect changes based on Census Bureau population estimates for July 1, 2012 and July 1, 2013. In the list that follows, the MSA or MISA 5-digit geocode/geoid, uniquely identifying this metro/CBSA among all others, appears following the MSA or MISA name. 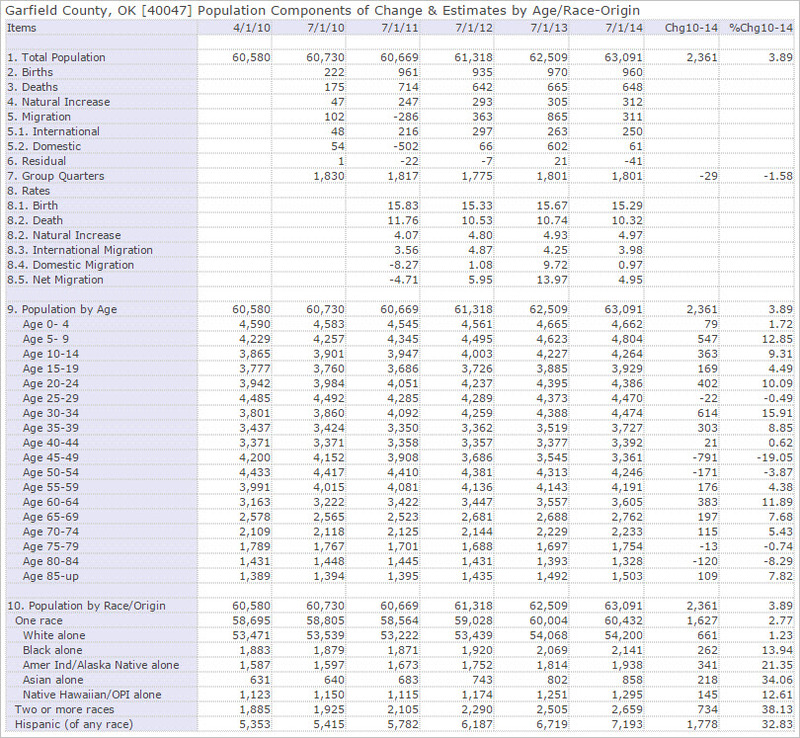 Click county code link, following county name, to view a demographic trend profile. Click graphic below to view the illustrative profile for Garfield County, OK (Enid, OK MSA). View county demographic change in context of other counties using this interactive table. View characteristics of principal cities in context of other cities using this interactive table. Alexander City, AL MISA added to Birmingham-Hoover-Talladega, AL CSA (142). Bonham, TX MISA added to Dallas-Fort Worth, TX-OK CSA (206). Fort Payne, AL MISA added to Huntsville-Decatur-Albertville, AL CSA (290). … see how your metros of interest have changed since 2010 — in terms of geography and demographics … all metros are listed in this section. To compare population change for a metro requires examining both the county composition of the metro and the population change by component county. Metropolitan areas are defined as one or more contiguous counties. Metropolitan area geography are periodically updated by OMB based on Census Bureau data. The current metro/CBSA vintage is as of February 2013. Many metros have changed boundaries (the set of counties included) since Census 2010. 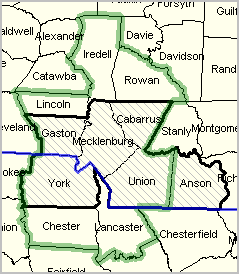 The map below shows different metro vintages for the Charlotte-Concord-Gastonia, NC-SC MSA. Click the link in the table to view a profile for this metro. The profile shows the addition of five counties relative to the Census 2010 vintage. The Census 2010 population of the 2013 vintage metro is 2,217,012 (25th largest) compared to 1,758,038 (33rd largest) based on the 2010 vintage of the metro. The Charlotte metro ranks 24th in population (2,335,358) among 2013 vintage metros based on the 2013 estimate. See Census 2000 and Census 2010 population for Census 2010 vintage metros at http://proximityone.com/metros0010.htm. Below we examine demographic change (2010 to 2013) by metro using the current vintage metro definition. 2013 green boundary; 2010 black boundary/hatch pattern; state blue boundary; counties labeled. Click graphic to view metro by county details. View the metro by county table shown below for the Charlotte metro for any metro of interest by click the link in the scroll section below. The current vintage 929 Core-Based Statistical Areas (Metropolitan Statistical Areas and Micropolitan Statistical Areas) are shown in the scroll section below. Click link to view metro by county profile. 94% of the U.S. population live in metropolitan areas. Metropolitan areas are comprised of one or more contiguous counties having a high degree of economic and social integration. This section is one in a continuing series of posts focused on a specific metropolitan area — this one on the Houston-The Woodlands-Sugar Land, TX MSA. This section illustrates how relevant Decision-Making Information (DMI) resources can be brought together to examine patterns and change and develop insights. The data, tools and methods can be applied to any metro. About metros. A thumbnail … in 2012, the Houston-The Woodlands-Sugar Land, TX MSA had a per capita personal income (PCPI) of $51,004. This PCPI ranked 23rd in the United States and was 117 percent of the national average, $43,735. The 2012 PCPI reflected an increase of 4.5 percent from 2011. The 2011-2012 national change was 3.4 percent. In 2002 the PCPI of the Houston MSA was $34,696 and ranked 37th in the United States. The 2002-2012 compound annual growth rate of PCPI was 3.9 percent. The compound annual growth rate for the nation was 3.2 percent. These data are based in part on the Regional Economic Information System (REIS). More detail from REIS for the Houston metro at the end of this section. The geography of the Houston-The Woodlands-Sugar Land, TX MSA is shown in the graphic below. The green boundary shows the 2013 vintage metro, black boundary/hatch pattern shows the 2010 vintage boundary, counties labeled. San Jacinto County is no longer a part of the metro. Click here to view a profile for the 2013 vintage Houston metro. Use this interactive table to view demographic attributes of these counties and rank/compare with other counties. The Census 2010 population of the 2013 vintage metro is 5,920,416 (6th largest MSA) compared to the 2012 estimate of 6,177,035 (5th largest MSA). See interactive table to examine other metros in a similar manner. View selected ACS 2012 demographic-economic characteristics for the Houston metro (2010 vintage) in this interactive table. Examine this metro in context of peer metros; e.g., similarly sized metros. 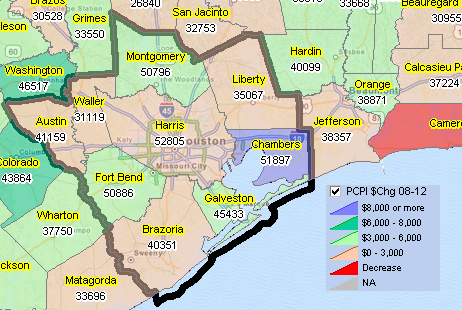 In 2012, the Houston metro had a median household income of $55,910, percent high school graduates 81.1%, percent college graduates 29.6% and 16.4% in poverty. Use the APIGateway to access detailed ACS 2012 demographic-economic profiles. A partial view of the Houston 2010 metro DE-3 economic characteristics profile is shown below. Install the no fee CV XE tools on your PC to view extended profiles for Houston or any metro. See U.S. ACS 2012 demographic-economic profiles. Viewing graphic with gesture/zoom enabled device suggested. View selected Houston 2013 vintage metro Gross Domestic Product (GDP) patterns in this interactive table. The Houston metro 2012 real per capita GDP is estimated to be $62,438 ($385,683M real GDP/6,177,035 population). — Use this interactive table to view, rank, compare Census 2000 and Census 2010 population for Census 2010 vintage metros (all metros). — Use this interactive table to view, rank, compare 2013 vintage metros (all metros) — Census 2000, Census 2010, 2012 estimates population and related data. The graphic presented below shows county population projections to 2060 for the 2013 vintage metro. Use this interactive table to view similar projections for all counties. The metro population is projected to increase to 2.8 million by 2030 and to 3.4 million by 2060 based based on current trends and model assumptions. Viewing graphic with gesture/zoom enabled device suggested. The graphic below shows the 2013 vintage metro (bold boundary) counties labeled with county name and county per capita personal income (PCPI). The legend shows the change in PCPI from 2008 to 2012. The above graphic illustrates the power of using visual analysis tools (CV XE GIS). These data are from the Regional Economic Information System (REIS) introduced earlier in this section. Use the links shown below to examine much more detail from REIS at the metro and county level. A thematic pattern map could be developed for any one of these items. The REIS data are annual time series starting in 1970 and continue to 2012. 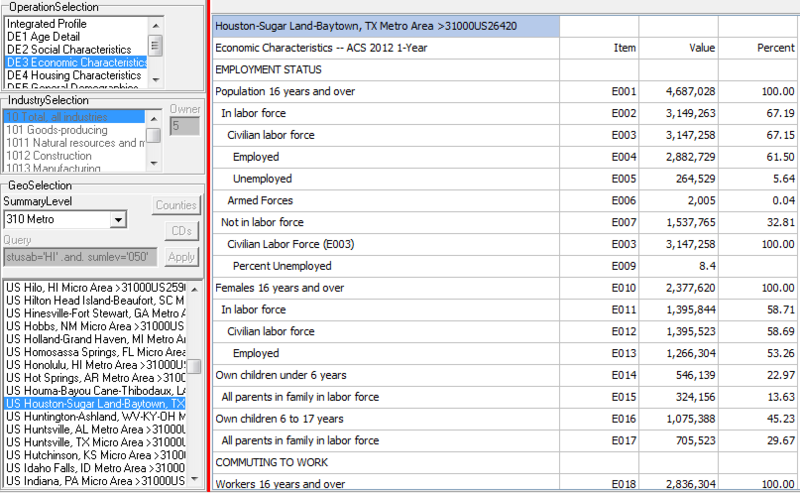 Click a link to view a sample profile spreadsheet for Harris County, TX and the Houston MSA for 2011 and 2012. We will review topics and data used in this section in the upcoming webinar “Metropolitan Area Geographic-Demographic-Economic Characteristics & Trends” on January 9, 2014. This is one of many topics covered in the DMI Webinars (see more). Register here (one hour, no fee). By definition, metropolitan areas are comprised of one or more contiguous counties. Metropolitan areas are not single cities and typically include many cities. Metropolitan areas contain urban and rural areas and often have large expanses of rural territory. A business and demographic-economic synergy exists within each metro; metros often interact with adjacent metros. The demographic-economic makeup of metros vary widely and change often. 2013 vintage metropolitan areas include approximately 94 percent of the U.S. population — 85 percent in metropolitan statistical areas (MSAs) and 9 percent in micropolitan statistical areas (MISAs). Of 3,143 counties in the United States, 1,167 are in the 381 MSAs in the U.S. and 641 counties are in the 536 MISAs (1,335 counties are in non-metro areas).